A situla is a bucket designed to hold holy water. 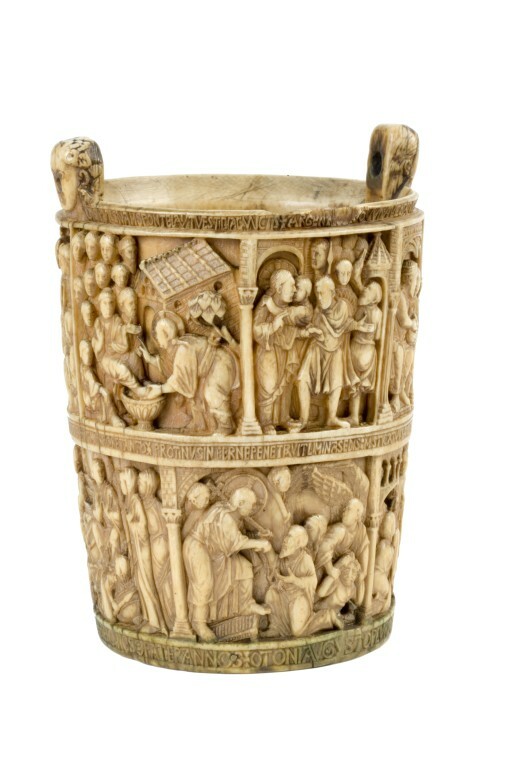 Ivory situlae are very rare and were apparently only made for special ceremonial occasions. Among the few situale which survive, this example stands out in the unusually high quality of its workmanship, and the great beauty of its composition. It is carved with twelve scenes from the Passion of Christ arranged in two rows and was probably made around 980 for the visit of the German Holy Roman Emperor Otto II to Milan. Three situlas from the Ottonian period have survived, one in Milan of about 979, the present, and one in Aachen of about 1000. Ivory situlas were made for special ceremonial occasions, such as an Imperial visit and used to remain in the church visited by the Emperor. The situla and a relief of Christ enthroned with the Emperor Otto II, his wife and child, both in Milan relate stylistically to the present situla. The relationship of the two situlae and the relief suggests that they were all made in the same place (although not necessarily in the same workshop) and Milan is the most likely centre of origin. 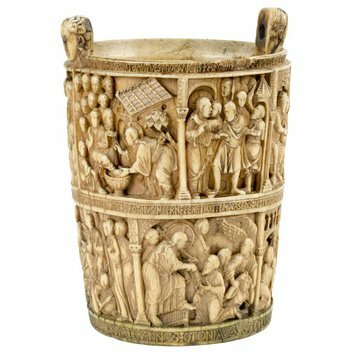 The holy water bucket (situla), bears twelve scenes from the Passion and Resurrection of Christ, arranged in two superimposed rows. In the upper row: Christ washing the Disciples' feet, the Betrayal of Christ, Judas accepting the 30 pieces of silver from the high priest, the Crucifixion, Judas returning the money to the High Priest, Judas hanging himself, the soldiers watching the Sepulchre. In the lower row: the Maries at the Sepulchre, the Harrowing of Hell, Christ Appearing to the Women, Christ Appearing to the Apostles, and the Incredulity of St Thomas. Tow human mask-heads stand up from the top rim, pierced at the back to take the ends of a metal handle. 3 bands of inscription. The two upper bands contain lines from the Carmen Paschale, a fifth-century hexameter rendering of the Old and New Testaments by Sedulius. OTONI AVGVSTO PLVRIMA LVSTRA LEGAT. May the Father who added thrice five to the years of Hezekiah, grant many lustres to the august Otto. Reverently, Caesar, the annointing- vessel wishes to be rememberd for its art. Bought by Ferenc Pulszky in Florence. Then in the following collections: Spitzer, Aachen; Dr. Chaffers (Sotheby's sale 17 February 1857); S. Attenborough, Basilewski, St Petersburg, Tsar Alexander III (1881-94), St Petersburg, and The Hermitage Museum, Leningrad. 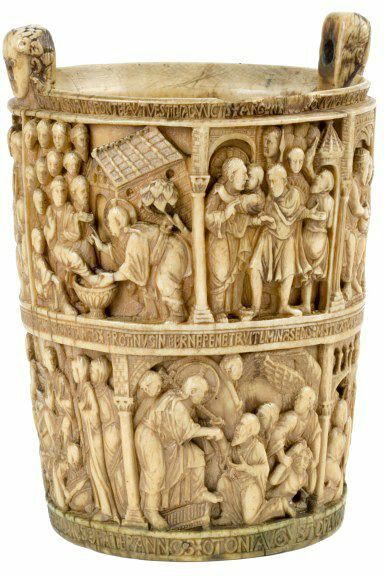 Historical significance: The Basilewski situla stands out from the group of related ivories in the unusually high quality of its workmanship, and the great beauty of its compositions. Although it was strictly speaking a vessel used in the official liturgy, it encapsulates, however, the contemporary ideas of the Ottonian kingship, its aspiration to the Roman imperial past, and its connections with the church; it is therefore a true imperial monument. The situla was produced in around 980 for the visit of the Emperor Otto II to Milan with his wife Theophanu and his infant son (Otto III). Three situlas from the Ottonian period have survived, one in Milan of about 979, the present, and one in Aachen of about 1000. Ivory situlas were made for special ceremonial occasions, such as an Imperial visit and used to remain in the church visited by the Emperor. The situla and a relief of Christ enthroned with the Emperor Otto II, his wife and child, both in Milan relate stylistically to the present situla. The relationship of the two situlae and the relief suggests that they were all made in the same place (although not necessarily in the same workshop) and Milan is the most likely centre of origin. P. Williamson (ed. ), European Sculpture at the Victoria and Albert Museum, London, 1996, p. 77. Mamat, U. Studien zu Mailandischen Elfenbeinschuifzenei der Ottonischen Zeit. PhD thesis. University of Vienna. 1968. Little, Charles T. 'From Milan to Magdeburg: The place of the Magdeburg ivories in Ottonian Art' in Atti del 10 Congresso Internazionale di Studi sull' alto medioevo. Spoleto. 1986. pp.447-8. Peroni, A. 'Nota sulla Situla di Gotofredo' in miscellanea Augusto Campana'. Medioevo e Umanesims. 45. 1981. pp.561-74. Peroni, A. 'Magdeburg e Milano: precisazioni e questioni aperte sugli avori ottoniani milanes; e sul ciborio di S. Ambrogio' in Ullmann, E. ed. Der magdeburger Dom; Ottonisches Eründung und Stautischer Newban. Leipzig. 1988. pp.82-87. Ribbert, M. Untersuchungen zu den Elfenbeinarbeiten der älteren Metzer Gruppe. Bonn. 1992. p.286, pl.190. Fillitz, h. Die Gruppe der Magdeburger Elfenbeintafeln. Mainz. 2001. pp.5-6. figs. 5a and b.
Crivello, F and Grazzini, S. 'Aliptes est, ut quidam dieunt, sculptor' . 'Osservazioni sulla situla Basilewsky'. Annali della Sculoa Normale superiori di Pisa. IV/ I. 1999. pp.199-220. Pevonii, A. 'Die Kunst Mailands und Obesitaiens vin 10. Jahrhundert: Elfenbein Plastik, Goldschuniedekunst' Zeitschuift des pleintschren Veuaiys für khugtwisseuschaft. 58. 2004. pp.197-223. Trusted, Marjorie. ed. The Making of Sculpture. The materials and techniques of European Sculpture. London. 2007. p.117, pl. 211. Williamson, Paul, The NACF and the National Collection of Sculpture. In National Art-Collections Fund Review,1986, pp. 79-80, fig. 3.